Can an Eight-Year-Old Make a Difference? We believe Kayden can. This is His Story. Kayden is always smiling and up for an adventure! 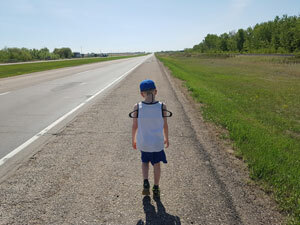 The Can-Survive Walk has been the most walking that 8-year-old Kayden Lefebvre has ever done. With his Mom, Dad, Grandma (Meme), Brother and Sister, he’s been walking a little bit every day on a journey to raise funds for programs and initiatives that help those affected by Cancer. “My favourite thing about the walk is walking as much as I can with my Dad,” says Kayden. 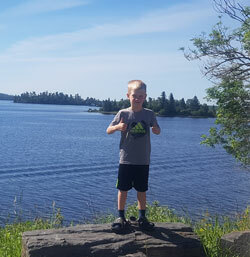 To beat the summer heat, Kayden says that swimming has been “the most fun thing” he’s done on the walk, and he’s loved swimming with his family in lakes and pools. His favourite place along the walk has been Winnipeg, where he enjoyed meeting extended family when the Lefebvre’s came through Manitoba. He’s also a big fan of the Winnipeg Jets hockey team. Along the roadside, Kayden’s picked flowers and found spare change, and he remembers meeting someone along the road who donated $100. He’s seen deer and a snake (a dead one) – and he most loves to tell the story of the time when the family’s motorhome was visited by a bear. Kayden and his family are walking to support The Lefebvre Foundation, created in memory of his Grandpa (Pepe), Simon Lefebvre, who died of Cancer in 2016. The Foundation’s goal is to raise endowment funds to help society become and live Cancer free through the effective use of awareness, education, support and treatment for physical and mental health and well-being of all those who are affected by Cancer. The Can-Survive Walk is a 5,716-kilometre walk being completed by Simon’s son, Jimmy Lefebvre and his family. The Lefebvre’s will walk 7.2 million steps from Grande Prairie, Alberta to Saint Louis, Prince Edward Island between May 1 and August 31, 2018. To support the Can-Survive Walk, visit our Donations page. Donations both big and small will go towards the L Foundation’s endowment fund. Thanks in advance for your support! To date, over $24,700 has been raised to eradicate this dreadful illness. According to the Canadian Cancer Society, over 80,000 people in Canada died from the disease in 2017.